Your Favorite Nostalgic Accessory, the Hair Cloud, Is Back! If you’ve run out of oily rags and shrimp husks, why not tie up your hair with a piece of the past? 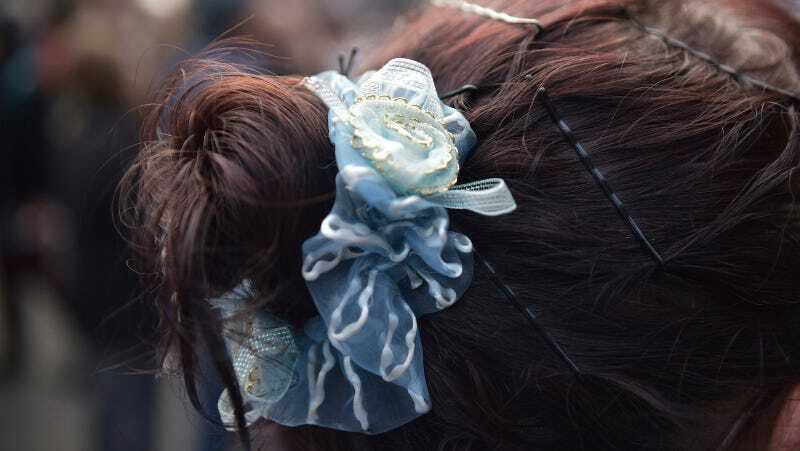 Scrunchies are back, and they want to get on your head and nest. WWD reports that the scrunchie trend is back, though it also never left, because American Apparel has been trolling the public with the threat of scrunchies for years. It’s so confusing. Are we in the ’80s? The early ’00s? Or is there some sort of evil fashion time traveler picking and choosing the worst looks from every decade? Hold your hair up with whatever you want. Old tinsel. A phone cord. Three soggy french fries held together with gum. But don’t put a scrunchie in my hair and tell me it’s weather.